There will be a short presentation followed by an interactive group discussion on our relationship with garbage and the role that creativity, imagination, and unconventional thought play in eliminating waste. 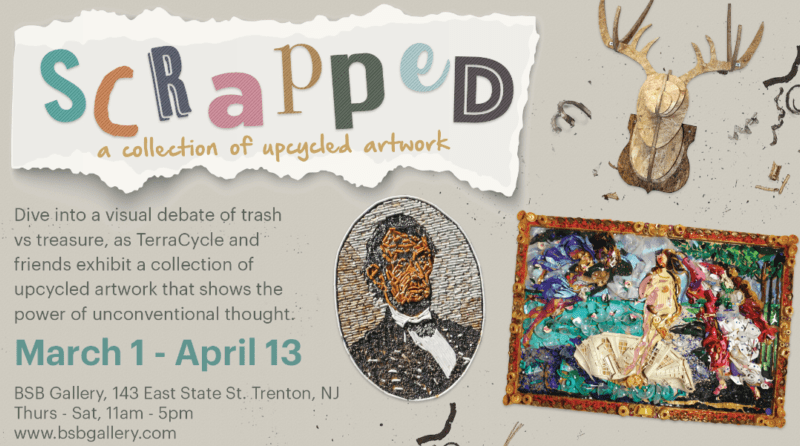 The Scrapped exhibit was a collaborative effort between TerraCycle and BSB Gallery, designed to encourage viewers to question their day-to-day lifestyle and their impact on the planet. The collection of upcycled art, which includes on-site installations and mixed media pieces of varying scales and styles, illustrates the power of unconventional thought and includes works from acclaimed artists Leon Rainbow, Ede Sinkovics, Heemin Moon as well as TerraCycle employees. All the featured art utilizes discarded and otherwise “scrapped” materials including old and broken toys, littered plastic collected off of beaches and shorelines, wine corks and cigarette butts, to name only a few. For more information on Scrapped or to learn about upcoming exhibits, please visit www.bsbgallery.com, BSBGallery on Facebook or email bsbgallery@trenton-downtown.com.